Space is at a premium for many of us so one of the questions I’m most frequently asked is whether a power rack can be safely used in the second floor of a house or in an apartment. Why it’s safe to work out in the second (or higher) story of your building. As long as you are careful to not drop weights on the floor there is no issue working out upstairs. Dropping weights may damage the floor so that’s why I would avoid it. To mitigate the risk slightly you can lay down some stall mats or other rubber tiles to act as a buffer between heavy plates and your (probably) timber structure. What this means in real terms is that you need to control your weights instead of dropping them – deadlifts for example should have a controlled return, not an Olympic style drop from height. I personally had a basic home gym set up in my spare bedroom and used it for almost a year with no issues. Commonly cages will measure around 1370L x 1200W 2160H. You will therefore need a minimum of 2.2m height and around 2mx2m floor space. When working with an Olympic bar which is 7ft long I recommend at least 2.5m x 2m of space, plus some buffer around this to load/unload plates on to the bar. These allow you to get the barbell onto your upper body safely. If you’re going for this option you should buy ones that have spotter bars (the horizontal pieces) which catch weight should you drop it, this will save your floor and possibly your back should the worse happen! These are the real deal and offer a wider range of workout options, you can perform pull-ups with the top of the cage, dips on the side, attach cables for pulldowns etc. 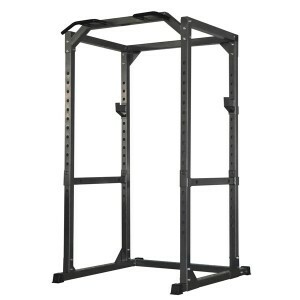 If you have space, a decent cage is the best piece of strength training equipment you can buy. A squat rack offers four posts instead of two so it can hold more weight safely and is sturdier in terms of wobbles. 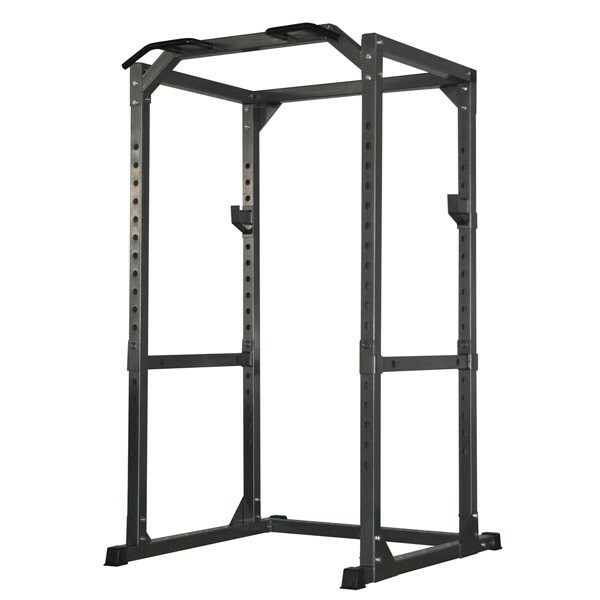 If you’re interested in a power rack then you should check out this review article first specifically for cages. 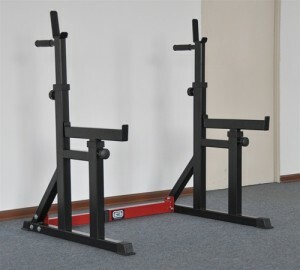 For the UK, Bodymax are at it again with a great stand set for those with limited room. 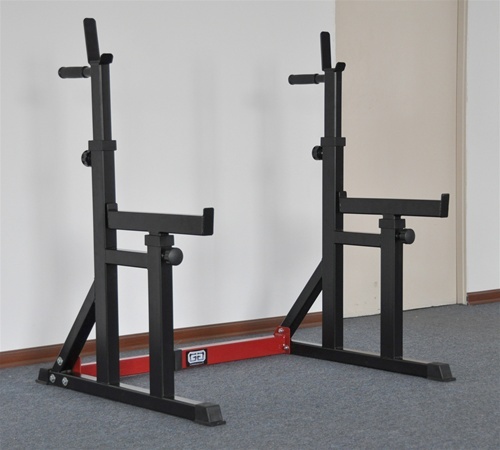 The CF415 has the all important solid spotter bars, and linked towers which makes racking/unracking much easier.